The Hale Medical Center in Arcadia, California, is an excellent example of a concrete tilt-up project that required creativity and teamwork in all aspects of architecture, engineering and construction … and it all came together as planned. The objective was the completion of a rare 4-story medical building, an unusually high achievement for the tilt-up construction industry in California. Watch the process! Three companies took on the challenge… Hakanson Construction, Inc. of Brea, CA acted as subcontractor for The Hale Corporation, of Monrovia, CA. and Miyamoto International of Santa Ana, CA acted as structural engineers for the project. The height of the building made this a challenging project. However, the extra story is valuable as	it provides for better utilization	of space; more utilized space on the building footprint. "We think 4 stories is the wave of the future”, said Gere Cooper, Hakanson’s General Manager. “It's a way to utilize the space given more efficiently. 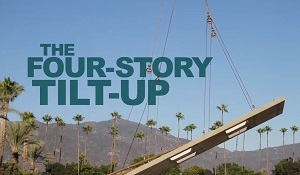 Typically at a height of 2 or 3 stories, achieving a tilt-up of 4-stories has its challenges, as the extra story adds obvious weight and height. The panels were up to	64’ tall, weighed approximately	80 tons each, and required	the larger 8-1/2’ wide x 3’ footing size. Additionally, there was the challenge of pouring 25,000 square feet of casting slabs, the utilization of a 325 ton crawler crane running on movable steel plates for the crane tracks and of course, the subsequent panel lift sequencing challenges." The final result? The finished building is large, beautiful, high tech, modern, and it includes a direct bridge connection to the Methodist Hospital campus. And … there is an extra “story” to tell!